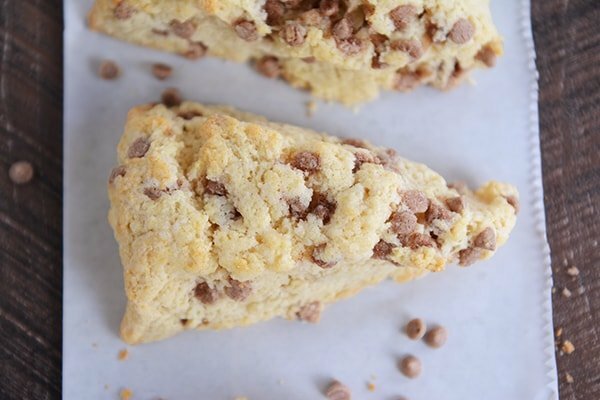 These cinnamon chip buttermilk scones are tender, buttery and perfect, plus, the base scone recipe can be used for endless scone possibilities! If you follow me on Instagram, you’ll know why I made these buttermilk scones four times before being willing to post them. Not that I have anything against blobby, spreading scones (they were terribly delicious), because I don’t, but I wanted a foolproof and pretty recipe to give you, and it took a few tries to get the measurements just right. Can we pause for a quick lecture about why a kitchen scale is so tremendously useful in the kitchen? It truly marks the line between experimental baking and no-fail recipes. I used to think only professional chefs, big baking nerds, or people with too much time on their hands had use for a kitchen scale. Several years ago my frustration over inconsistent baking recipes mounted high enough that after screaming in my pillow too many times to count over failed cookies, a kitchen scale ended up in my kitchen, and it’s definitely one of my most prized kitchen tools. I include weight measures for most of my baking recipes and rarely use a recipe online or in cookbooks that doesn’t include weights, because, call me crazy, I kind of like it when recipes turn out perfectly the first time, don’t you? If you are morally opposed to using a kitchen scale, please, please, please read this post on how to measure flour accurately. Ok, phew! Rant over (for now). Today’s all-purpose buttermilk scone recipe (that I should be talking about instead of lecturing about scales) is infinitely adaptable. If you don’t have cinnamon chips, use mini chocolate chips! Or play around with other flavors – maybe lemon or orange zest with an accompanying glaze? The base buttermilk recipe is so fantastic, it deserves to be put to work. But I will say that the cinnamon version is absolutely magical. The little cinnamon morsels soften just a bit while baking, leaving behind pockets of sweet, cinnamon flavor with every bite. I love the mini cinnamon chips from King Arthur Flour but I think regular cinnamon chips from the grocery store baking aisle will work just fine, too, and probably leave you with even more cinnamony goodness. I included a few step-by-step photos ; sometimes a quick visual helps, especially if you haven’t made or perfected the almighty scone method. It is similar to a biscuit with the cardinal rule: DON’T OVERWORK THE DOUGH! Sorry to shout, but in the interest of avoiding tough, dry scones, it seemed necessary. Having made these buttermilk scones about a bajillion times over the last month, I can honestly say as a very proud and vocal scone lover that these are some of the best scones I’ve ever had. I’ll be using this base recipe for just about every scone event from here on out. I’ll also be encouraging my family to strongly think about making these for Mother’s Day; although just between you and me, I’m not above making my own food on Mother’s Day as a means to a very happy end for everyone. Preheat the oven to 400 degrees F. Line a large, rimmed baking sheet with parchment paper and set aside. In a food processor (see note if you don't have one), combine the flour, sugar, baking powder, baking soda and salt. Pulse to combine. Add the butter and pulse until the butter is cut into smaller pieces - don't overprocess here; the butter should be no smaller than pea-sized pieces. Add the buttermilk and vanilla and pulse a couple of times until the dough starts to come together; don’t overmix - it’s ok if there are dry, crumbly spots here and there. Remove the blade and add the chips, using your hands to knead them in a bit. Turn the dough out onto a surface dusted with 1-2 tablespoons flour and combine the dough and chips together with your hands, kneading briefly, just 2-3 times, until it comes together. Pat and lightly press the dough into a long rectangle, about 15X3-inches. Cut the length of dough into triangular wedges, about 12-14 and place on the baking sheet, about an inch apart. Brush the tops with melted butter and sprinkle with sugar. Bake at 400 degrees for 15 minutes until just lightly golden brown and no longer doughy in the center. I have subbed half of the all-purpose flour with white whole wheat flour with pretty good results. The variety of cinnamon chips I use are on the miniature spectrum (similar to a mini chocolate chip) which means they easily find their way into all the nooks and crannies of the scone dough. If you use the cinnamon chips from your every day grocery store (similar to regular-sized chocolate chips), you might want to increase the amount and add 1 1/2 cups since they won't distribute as evenly as the mini ones. 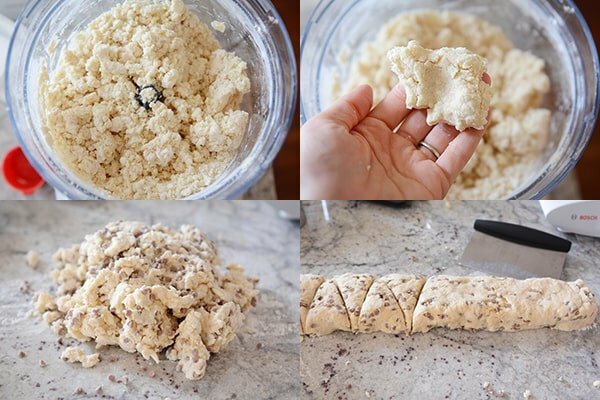 I almost always use a food processor to mix up scone or biscuit dough. It's an awesome tool to avoid overmixing the dough. If you don't have a food processor, cut the butter into the dry ingredients using a pastry blender or two butter knives. If doing so, you'll want to get the butter/flour mixture incorporated together until the butter is in pea-sized or slightly smaller pieces before stirring in the buttermilk with a wooden spoon or large spatula. It's definitely doable to make these without a food processor so don't let that be a deal breaker. This recipe belongs in the “BOMB.COM” file….I use it for different variations, but the cinnamon chip are my FAVE! I will also brush with butter and sand with cinnamon sugar because CINNAMON…. These were awesome. They were light and not to sweet very good basic recipe add the cinnamon chips and takes it to a whole new level. Came out really gluey.. I followed the recipe exactly but they just taste like floury paste.. I’m going to put a glaze on them when they cool and see if that helps. Absolutely perfect scones, I love them! I also had trouble finding cinnamon chips so I thought there must be a way to make your own. I found this recipe and I liked them so much better than what you buy and they worked awesome in these scones!! Thank you for sharing this scone recipe!! I made this recipe only used 2 cups of sour cherries instead and did a glaze with icing sugar, milk and almond extract, so I did not put the butter and sugar on them before baking. They were a hit. One thing that works great if you do not have a food processor is to grate your butter and it works like a charm. First time I made scones and the ladies at work loved them as well as my family. Made these and substituted mini chocolate chips for the cinnamon. They were fabulous!! I love making them in the food processor-I always make my buttermilk biscuits that way! I want to adapt a cranberry/orange version soon since those are my favorite. I just made them! Very yummy. I also had trouble finding the cinnamon chips. I talked to the manger of my local grocery bakery and she was able to sell me some. Thank you for sharing . Can you make this using a scone pan? If I’m making Cheddar scones do I put any sugar ?? I would still add a tablespoon for flavor. What temperature should I bake them at in a convection oven? Probably about 25 degrees lower than the recipe states. I love these scones. I have also had trouble finding the cinnamon chips, but if you ask your local grocer they will usually order them for you. I store my chips in the fridge since they melt easily and I live in Florida. Winn Dixie usually carries the Hershey chips. You can order Hershey’s on Amazon! ❣ I’m going to make these for Thanksgiving breakfast! I can’t wait to try this recipe. I’m a cinnamon fan!! One problem is that I am having a hard time locating cinnamon chips. I was thinking of making a cinnamon brown sugar scone using the base in this recipe. Any thoughts on how I could make this work? I am a very novice baker. Is the butter used in this recioe salted or unsalted? Dearest Mel – Did you know that with this recipe you have out-sconed the entirety of the United Kingdom, the birthplace of the scone? Having had occasion to sample a few of the British variety of scone, most recently on a trip to Cornwall over Labor Day weekend, I will admit that I sniffed disdainfully at the offerings there. That didn’t keep me from eating them as they were served with clotted cream and strawberry jam. (Why isn’t clotted cream a thing in the states? It’s sooooo amazing!) But I informed my traveling companions that these scones had nothing on Mel’s. And since they had been the lucky recipient of a batch from my kitchen, they were forced to agree. It’s not bragging if you can back it up, right? BTW – I’m a huge fan of the freeze the butter and then grate trick. Works like a dream every time. Anywho, thanks for this recipe. And for all your other recipes. You truly do make me a rockstar in the kitchen! Haha, this comment was the best ever, Ida! So happy you loved these scones…and I agree…clotted cream needs to become a thing here! Can you use a gluten free blended flour for these scones? I haven’t tried that but you could probably experiment…good luck if you try it! Mel, I’ve been making these scones for a couple years now and love them. But where are you buying your cinnamon chips? King Arthur Flour doesn’t carry them anymore and I’m down to my last bag. Haha, so cute! I would probably store them covered in a resealable bag or even on a baking tray covered with plastic wrap. I had a bag of the cinnamon chips that I had no idea what to do with so I decided what the heck, I’d give it a try. I worked in a coffee shop/bakery a couple years ago & they bought frozen scones, already shaped, I just had to bake & glaze them. I told the owner I would try making them, she said it was too hard to make them without them being dry & hard. I had never even eaten one but the frozen ones weren’t to my taste at all altho they did sell. I am so impressed with this recipe, easy, they are good, light & not dry at all. Plus they warm up nicely the next day. Hubby has eaten more than his share & he isn’t one to eat much carbs. A big winner Mel! I did have to abort half way thru as my 7 cup food processor just wasn’t big enough but it still worked out fine. Thanks for sharing this easy recipe! I have never made scones before. Have always been afraid to try. Thank you for the great detail you added to help make this recipe a success . They ARE OUTSTANDING ! I had Hersey cinnamon chips and used the whole bag (1 1/2C) this recipe is a keeper for sure. I’ve been making these for awhile and they’re my go-to recipe. Perfect texture. Quick and easy. The only issue is that the cinnamon chips that I used to get from King Arthur Flour aren’t available anymore. I’ve been using their Cinnamon Sweet Bits instead. They’re good, but I do miss that crunch. Mel, your cinnamon scones are delicious. They turn out perfect every time. I have some frozen blueberries I need to use and was wondering if you’d ever made blueberry scones before. The most amazing scones I have ever eaten – moist and delicious! I’ve made 3 times as written and all three times came out perfectly! Thanks for the excellent recipe. New family favorite! These scones are PERFECTION. I modified it slightly: I added cinnamon (used Mexican Ceylon cinnamon since my older kid prefers it), used heavy cream (clabbered) instead of proper buttermilk), and baked them on parchment paper on a pizza stone. I also grate cold butter and work it in with my hands, which I find gives me a better feel for how the dough is feeling and if it’s ready. When my hands hurt, obviously, the food processor is better, though. They came out beautifully crisp, tender and short on the inside. The added cinnamon just enhanced the flavor, and these were perfect with tea, perfect warm, perfect once cooled, and reminded me delightfully of my childhood when we would roll out extra pie crust, sprinkle it with cinnamon and sugar, and bake it as a snack while pies were baking. These were better than that, but the flavor was nostalgic for me. Thank you for a perfect–and incredibly flexible!–fantastic recipe! We love these just as instructed, but I want to use the base to make blueberry scones. Should I use my blueberries straight from the freezer, or should I thaw them first? When I use frozen blueberries in muffins and such, I use them straight from the freezer. They “bleed” a little more than using fresh, but I’ve found when I thaw and drain, I don’t like the texture in the baked goods as much. These are ridiculously good. I just returned home from a trip where I had cinnamon chip scones from Copper Moon Coffee, that were so delicious, I wish I would have purchased more than one. I looked for a recipe that looked as good as they did. I FOUND IT!!! This recipe is moist and ridiculously good !!! This is the best scone recipe I have tried. My husband hates scones because they are usually dry. But he loved them. Its the buttermilk. Any recipe with buttermilk is my favorite. Thanks so much for sharing this recipe Mel. I have already emailed it to friends. Plus they were fast and pretty easy to make. THANK YOU !!! Great recipe Mel! I split my dough in half and did half with blueberries, half with chocolate chips – both are fabulous. Looking forward to my breakfasts for the next few work days. These are so tasty, and they are pretty fool proof. I’ve made them quite a few times. Thanks for another great recipe! So I made these last week with cinnamon chips per your recipe exactly and they were brilliant! My husband doesn’t even eat scones because he says they’re dry and dense but he ate like 3. I have a question I was wanting to do a strawberry version is there anything that you would change if you were using fresh cut up strawberries in place of cinnamon chips? I’m new to the scone world. Hey Jennifer – I have a strawberry scone recipe here – would that work for what you are wanting to do? I just made an orange, craisins version. Yum! It is a terrific scone recipe. I’m excited to apply my favorite scone flavors into it. My very favorite is one with bananas and cardamom. The only change I’ll probably make to the recipe is brushing with an egg wash instead of more butter. So happy to have this recipe! Yestarday I saw them and I bought them righit away! haha, so I will give it a try 🙂 the only one thing I am thinking is, I will add some cinnamon powder to the dough, I love cinnamon flavor! I find Amazon is a GREAT place to get uncommon baking items like cinnamon chips–that’s how I got mine (I ordered in winter on purpose)–and if Amazon in Canada delivers such items, it can be a great resource. Just made these again but this time used blueberries and lemon zest instead of the cinnamon chips. Sooo good! Just made these this morning! They are very close to the ones I make for the holidays, orange and cranberry, so I’m glad I went with my usual routine of trusting the wet/dry ratio; it really does come together nicely. My store only carries the Hershey brand, but it is yummy. I can’t believe that I’m actually going to be a nag and request the King Arthur’s brand, just to see the difference! Stores are all about satisfying the customer, so let them know! Made this a little while ago and they were super yummy! I used all light brown sugar since I was out of white sugar and this worked out just fine! We made these this morning and pulled them out just as we lost power ( thanks to tropical storm Hermine) and they were delicious! We used regular chocolate chips but I will be on the lookout for the cinnamon chips. Thanks for another great recipe! Oh my goodness, stay safe, Jessica! Thanks Mel! I have made 4 batches so far this week and making another tonight! I have called every store in the Savannah, GA area looking for the cinnamon chips with no look. I am going to have to break down and order from KAF but the shipping is more than the chips!!!!! Thanks! Are these something that freezes well? I’d like to make them now and freeze them to have on vacation later. These were the best scones that I have ever made! Just like my favorite tea and scone place! Thanks, Mel, for another HIT! This is why your website is my all time favorite! I used to make scones a lot, but I got lazy. My recipe had you grate the butter in, which is a bit time consuming. The food processor is brilliant! I made these, and they’re amazing! We liked them better the next day reheated in the toaster oven. I topped them with cinnamon sugar. They’re so good, and I can use the recipe for all different kinds of scones! These are sooooo good. Made them for Mother’s Day brunch and they were the hit of the day. I live in Texas and I ordered the mini chips from KAF. A couple were melted and the temp here at the time was low 80’s. There mini chips are perfect for these scones. The only thing I added was an icing drizzle, using 1 cup powdered sugar, 2 tablespoons of brewed strong coffee and 1/2 teaspoon vanilla. Excellent! I agree about shipping costs – I hate paying so much in shipping but usually when I order from KAF, I’ve saved up my list of things I want and order it all at once to maximize shipping. I live in Idaho and I’ve never paid for the insulated bag – granted, I think I’ve usually ordered the chips in winter or spring but I just ordered them a few weeks ago and they were fine. I think if you avoid the heat of the summer you should be ok. These were great! My dough was really crumbly when I turned it out and I ended up adding a couple of tablespoons of milk to hold it together. I love King Arthur’s recipe for harvest pumpkin scones and adding their cinnamon chips. These are a close 2nd! 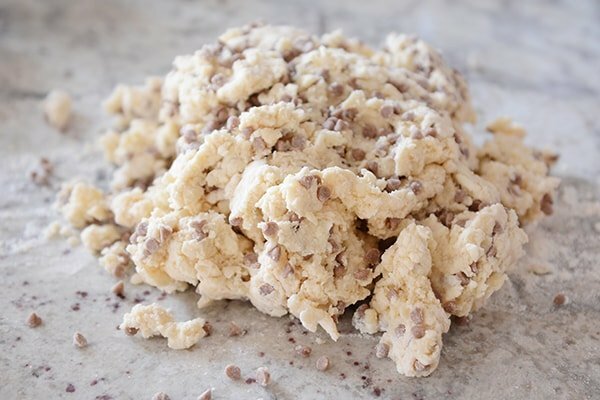 I’ve made these twice now–once with mini chocolate chips and once with cinnamon and they are amazing…however, every time I bake them they spread in the oven and do not come out looking so great. They go in as lovely triangle wedges and come out as varying triangle-ish blobs with maybe one or two on the tray looking somewhat normal. Luckily I was just feeding them to my family so I didn’t care too much that they looked strange. Is this normal? Any idea how I can fix the problem? My sister is having a baby today and I’d love to take her family some delicious scones with a meal! Any suggestions you might have would be appreciated. Thanks, Mel! Try adding another 1/4 cup flour – that should help! The king Arthur website recommends freezing your scones for 30 minutes (pan and all) before baking them. I really do think this makes a difference. These were a hit! Can’t wait to make them again. Made these last night for FHE ‘treat’. Boy were they a hit! They have an amazing texture and the mini cinnamon chips were just right for sweetness. I used another reader’s tips and grated frozen butter into the flour. Worked like a charm. Thank you for all your amazing recipes! You truly make it hard for me to be humble in the kitchen. Mel!! Darn you. These babies are trouble! I’ve never before made scones and decided to give these a try because they seemed really simple to make, and I needed something to take to my vt sisters. They were soooo good! It’s a really good thing I had people to give them too, I ate way too many as it was. If I want to make the scones smaller, would you recommend baking for the same amount of time or less time? And is this recipe amenable to doubling? I’d suggest altering the baking time if they are smaller – exact time will depend on the size. And yes, this recipe doubles great. Would fresh fruit work in this recipe? I need to use up some rhubarb, but wondered if it would make dough too wet. I think a lot would depend on the fruit. I actually think rhubarb would work pretty well. I’ve made scones before with strawberries (which are pretty wet) and they worked out well. Can’t get cinnamon chips here (except during Christmas holidays) so I’ll have to order from KAF. They have regular and minis. Which would you suggest? Thanks! She says minis are best because they more easily spread throughout the dough so you get some in every bite. I made these for a teaparty..perfect. I added about 1/4 tsp almond extract. I will be sharing these on my blog soon. Thank you for the delicious spring time treat! The base recipe be good for a savory scone? Yes, I think it would work great! I’d decrease the sugar to just a tablespoon. My children and I love scones! We love your pumpkin scones and the chocolate chip ones as well. I made these without the cinnamon chips (I didn’t have any) and added cinnamon to the dough and made a cinnamon glaze to drizzle on top. They were delish! I will be ordering the cinnamon chips today so I can try them that way as well. I love to make scones with King Arthur’s cappuccino chips as well! Or a mix of chocolate and cappuccino chips. Yum! Hi Mel, guess what I made last week? Sultana Scones. They were just delightful, I made my mums Chantilly Cream to go with them. This recipe looks fantastic, but I will have to sub cinnamon in as we don’t get cinnamon chips in Australia. They sound amazing though. Have a great day. Absolutely! Refrigerate the unbaked scones and then pop them in the oven in the morning (maybe add a minute to the baking time to account for chilling). These turned out so, so, SO good! This was my first time making scones and I have to say you made me look like “Wonder Woman” with this recipe!! (And apparently my dog likes them too, because as soon as I turned my back, she reached her little paw up, grabbed the pan and ate 10 out of the 12!!! Arrgggg!!! 🙁 🙁 ) these were so darn good however, that I am headed back into the kitchen to make my second batch (and this time I’m putting the dog outside!) thanks again!!!! 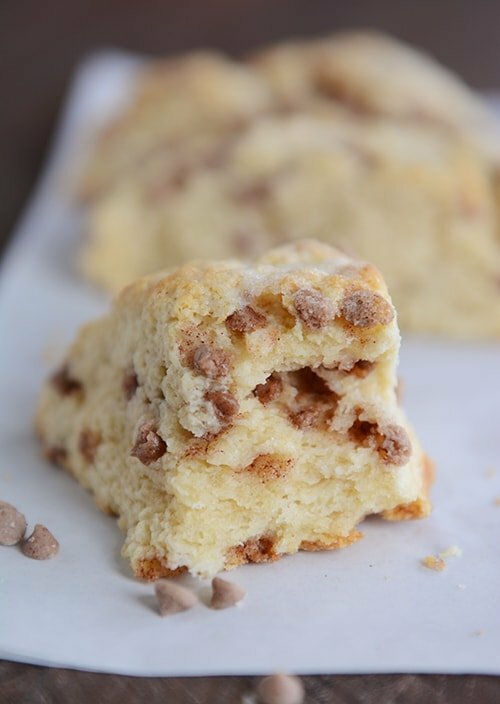 Cinnamon scones are one of our favorites. These do look absolutely amazing! These look gorgeous. 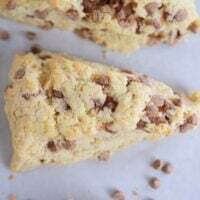 I have been making cinnamon chip scones forever and have been using the KAF cinnamon chips since they’ve been available, which has been many years. I love them. The Hershey’s grocery store brand is fake tasting, and I think these are just perfect and love the mini size, like you said. I also purchase the sparkling white (glittering/decorating) sugar at KAF to sprinkle on top rather than granulated. It gives a great crunch and makes the scones look like a professional bakery item (not that yours don’t!!!). I love how you can really see the sparkling sugar on top. My recipe uses only whipping cream so they can be made quickly by hand, but I am going to try these in the processor for comparison. I am sure they are delicious! Mmmmmm!!!! These are so good!! Thats what I’m hearing from the kitchen table right now from my kids. Another home run Mel!! Thank you!! Yes! A good kitchen scale and a secondary oven thermometer have allowed me to cuss a lot less when I’m baking. I don’t weight things as much as I should… but only because I need to change the battery in my scale and can’t find a small enough screwdriver and when I find the screwdriver- I can’t find the battery I bought. DOH! lol I have made scones before and love them. They are an all occasion item and want to branch out from my basic one. 😀 Thanks for sharing! 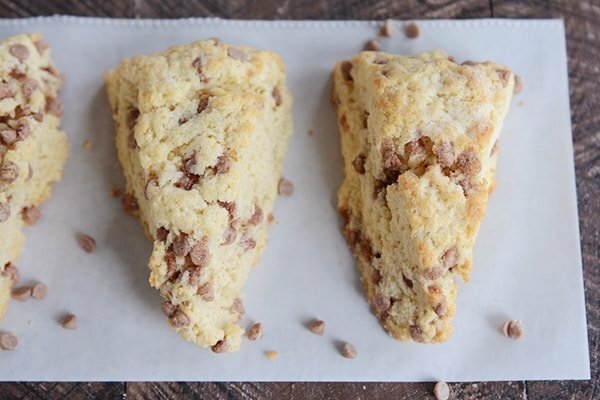 How did you know that I have been searching for and reading dozens of scone recipes for specifically (1) an awesome basic scone recipe, and (2) to make mini cinnamon chip scones? (I may OR may not hoard those little lovelies in my basement.) I had yet to find the recipe, until this morning! Seriously, recipes-of-my-heart (a for-real thing) reading is a skill of yours! Is it possible to sub a lactaid free milk for the buttermilk? That’s a good question but I don’t know, Jennifer. The recipe relies on the buttermilk for tenderness. Could you add a little lemon juice to the lactaid free milk to approximate the buttermilk? That is a good thought, I will try that. Thanks! These look yummy; thanks for the recipe. I also get cinnamon chips from The Prepared Pantry. Scones don’t have to be just for the sweet tooth — one of our kids’ favorite dinners is diced ham and cheese scones. You could also do something like a poblano and goat cheese with sausage… go crazy! My kingdom for cinnamon chips!! I have placed an order with King Arthur, because I already made these sans cinnamon chips: used almond extract and the zest of an orange, plus worked some zest in the sugar topping. Very good and perfect texture! I used to make scones often and haven’t for some time. Opened up MKC to see this AND I had fresh buttermilk from making ghee (cream to butter to ghee with buttermilk as a happy by-product) – anyway perfect timing except for the cinnamon chips. Thanks for a great start to Monday morning, Mel! I always love your comments, Liz; you win some kind of award for making a lot of my recipes as soon as they are posted (and I bet before many people are even up!). It’s awesome! And I’m really intrigued by your cream to butter to ghee process. Sounds fun! How do you make your cream to ghee to buttermilk? I would love to try to make ghee and often skip recipes with buttermilk as I never have any! @Brandee You can click on my name in the above comment to see instruction on my blog. It is not a cooking blog, just my own little web diary 🙂 – but I sometimes post things I make and I had just done all and taken photos when Mel posted this scone recipe. The short story for buttermilk is that when you take heavy cream beyond whipped cream, the butter (fat) separates from the liquid (buttermilk). This takes about 5 minutes in a food processor or blender so if you have cream and need buttermilk you could do this and you’ll end up with fresh butter and some buttermilk. I have a 7 cup food processor and do 16 ounces of cream at a time which yields approximately 1/2 cup of buttermilk and I’ve never measured the butter but somewhere between a baseball and softball chunk. Probably lemon juice in milk method is faster if you have milk and lemon juice. Mel has a post of substitute methods. Ghee is made with the butter cooked until the solids separate and you skim off the solids leaving the golden ghee. You don’t need to make ghee to get buttermilk, just heavy cream per above. Ghee is made with the butter cooked until the solids separate and you skim off the solids leaving the golden ghee. Basically, you simmer the butter until the solids separate and then strain. So, you make butter and buttermilk from the cream and then ghee from the butter. This is essentially the same scone recipe I use and it really is the best! I think buttermilk is just magical 🙂 Besides chocolate chip or cinnamon chip, another fun variation is white chocolate chip with craisins! Another butter tip: I don’t have a big enough food processor for making dough. I also loathe a pastry blender, so instead I shred frozen butter on the large holes of a grater and just stir it into the dry ingredients. It works great! Perfect, thanks for the tip, Becky! Thank you! The tip to grate the butter saved my day! This is a delicious and easy recipe! My family devoured them!! I can’t find cinnamon chips anymore here in New Hampshire!